President's Message: Are we there yet? “Are we there yet?” this phrase has been heard many times from the back of the family station wagon, on vacations, visiting relatives, trips to stores and travel anywhere. We heard it from our kids, grandkids, we even said this phrase ourselves, from the rear seat somewhere across this nation, I bet it was heard on the Mayflower on its voyage to America. We have heard this in our journey down our Grange pathway through the degrees. So I ask you to think “Are you there yet?” in your Grange journey. When we come into the Grange we are welcome as family and new laborers in our order. Have you stepped up to the challenge or have you become one of those who pay their dues and never go to a Grange meeting. If you are out of state I can excuse the meetings but do you keep in touch with your fellow Grangers or just the Secretaries for dues? If you read this paper and not pay for the subscription, did you thank your Community Grange for paying for the subscription? 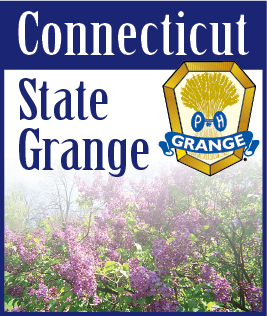 Dues today cover just the National and State Grange dues, today $26.50 covers those, and the Granger is $2.50 for Granges that subscribe for 100% of their members. So are you there with your fellow Grangers? Many of our Community Granges are being held together with fewer than 10 members working to keep the Grange going. We have worked and begged them to get new members. We know it is a hard task when our communities are so busy with other activities that today’s families are out of time for another meeting, organization or function. So I call upon you members on the sidelines come back and renew your Grange Pledge and get back into the game, we need you in the halls, not just the bank book. I had a wet time at the New England Grange Sunday, at Rindge, NH. Thought I gave plenty of time but three downpours slowed me down. We made it before the collection, full house in the chapel and had a good seat next to the roaring fireplace. Awaiting my next challenge the New England Lecturers Conference in Maine. Many deputy reports are still coming in and replies will be out end of August and first of September. It great to read the many things that our Grangers are doing but its sad that our Grangers journeys have stopped at the first four degrees. Our Pomona Granges do not have full representation of all Community Granges in the area. Pomona Granges allow members to meet others and hear what your neighbors are doing and to get new ideas to bring back to your Grange. Pomona Granges are also the place for resolutions to go to get more support than just your Grange, and reading the first time at State Session. Pomona Grange also can help with resources to help with Degree Days. Three Pomonas had Degree Days this last year. A letter went out to Secretaries for addresses of members. Please send them in to the Central Office, one to update our records and to send a updated list to the National Grange. If members do not wish to receive mail from the National Grange, they can go to the National Grange website and block their address. As we finish up our summer travels we have always heard from the driver of the family station wagon “now if everyone is good we will stop for ice cream.” “HOORAY everyone wins! !” Happy Summer.